Bill Schenck is a contemporary American painter who incorporates techniques from Photo-Realism with a Pop Art sensibility to both exalt and poke fun at images of the West. Like the heroes he idolized in B-Westerns, Schenck might well be called the “Good Badman” of Western American art. His irreverence in associating western heroes with racism, the drug scene, consumerism and sexuality let to an evolving series of works. Among them one finds deserts populated with cowgirls sipping champagne on the bumpers of Rolls Royces, Native Americans contemplating the statistics of their land loss, and “cerealized” self-portraits of the artist in leather and sunglasses. Born in the Midwest in 1947, a quintessential baby-boomer, Bill Schenck attended the Columbus College of Art and Design from 1965 1967. He then transferred to the Kansas City Art Institute in Missouri, where he received a Bachelor of Fine Arts degree in 1969. One week after graduation, he moved to the Soho district of New York City, where many first generation Photo-Realists, Color Field, and Minimal painters were gaining national and international acclaim. In the mid-1970s, a growing fascination with the simple lifestyle emulated in his paintings encouraged Schenck to move to the West, splitting his time between Arizona and Wyoming. Now the artist had real life situations from which to draw upon for his compositions and he made increasing use of his own photography, eventually diminishing the use of the fantasy-based movie stills in favor of a new fascinationthe true American West. Since 1971, Schenck has had 72 solo shows, 77 group shows and is included in 31 museum collections worldwide. 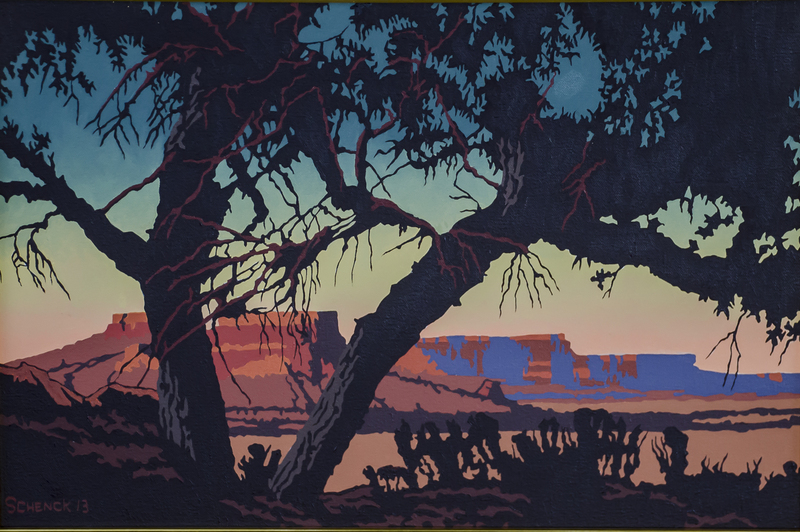 His work is found in major collections throughout the world and has been the subject of four museum retrospectives, the most recent titled “The West As It Never Was”, at the Albrecht Kemper Museum of Art. Chosen by a panel of scholars—Peter Briggs, University of Arizona Museum of Art, Brian Dippie, University of British Columbia, Don Haggerty, Author, Peter Hassrick, University of Oklahoma, and Anne Morand, Gilcrease Museum—, Schenck was included in a recent show at the Desert Caballeros Museum titled “Masters of Western Art, 1900-2000. This show featured the works of 30 leading painters, sculptors and photographers. The exhibition tells the story of Western Art, its remarkable persistence, and the changes wrought upon it by time and cultural attitudes. Born and raised in rural Ohio, he is a pop-artist and photo-realist painter of western figures and landscape who settled in Mesa, Arizona in 1975. He attended the Columbus College of Art and Design in Ohio and then graduated in 1969 from the Kansas City Art Institute. In 1971, he went to New York City and worked for Andy Warhol whose influence is obvious in his work. He moved West because he loved the subject matter, and the Elaine Horwitch Galleries of Scottsdale gave him a solo show. In the 1980s, he began painting in Canyon de Chelly in northeast Arizona. He works from projected slide images by numbering sections and having assistants apply the paint.